LOUISVILLE, Ky.—April 13, 2018—Depending on your household, laundry day is once a month, once a week or even once a day. But on the official Laundry Day – April 15 – GE Appliances polled the public to get down and dirty about their laundry day habits. What we learned is that your friends, neighbors and colleagues are hiding four dirty secrets. Ever heard the phrase, those jeans could walk on their own? More than a third of people (37%) wait until they’ve worn their jeans at least five times, with 16% waiting until seven or more times, to wash their jeans. That’s a lot of jeans around you that can walk by themselves. 50% of those polled live by the philosophy that “I’m clean when I use it” because they all admit to using their bath towel at least five times before throwing it in the washer. An additional 14% use their bath towels more than eight times before it hits the laundry basket. According to the poll, if your pillow case could talk, it might say “wash me.” A whopping 27% only change their bedsheets once a month – and 11% more wait longer than a month. When laundry day does come, only 40% of people between the ages of 18 and 44 put their laundry away when it’s done. The other 60%? Well they might have a problem with follow through because the laundry sits in the dryer or in a basket for extended periods of time before being folded. GE Appliances has compiled a lot more dirt on laundry based on 1,509 responses from people 18 years or older. Watch our social channels for more or visit www.geappliances.comto see how we’re making laundry day more of a pleasure than a chore. 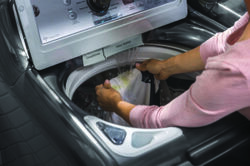 A survey from GE Appliances polled 1,509 Americans about their laundry habits.